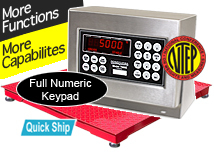 Order accurate 3x3 floor scales shipped in a timely manner from FloorScalesDirect.com. 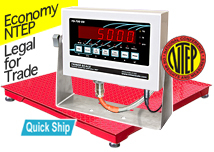 Our industrial weighing scales provide accurate readings up to 5,000 lb in 1 lb increments and are calibrated in the factory. 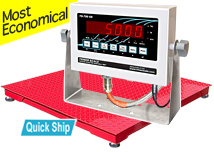 Each 5000 lb floor scale package arrives ready to connect with a weighing deck, digital indicator, and necessary cords and cables to use and connect. FloorScalesDirect.com is proud to offer free shipping on our industrial floor scales shipped within the USA as the manufacturer. These self leveling, shock absorbing floor scales for sale offer many new features as well as include several NTEP certified scales. We offer a large selection of 5000 lb floor scales for sale for warehouse shipping and receiving, container weighing and Gaylord weighing. 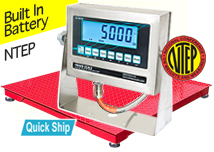 Quality customer service is another aspect we value, by providing toll free service at (800) 238-0152 and help ordering as well as a tracking number for all industrial weighing scales shipments. Choose to shop 3x3 industrial floor scales from FloorScalesDirect.com, a division of the Triner Scale & Manufacturing Company.